Eilish O’Connell, our Clinical Education facilitator, won an All-Ireland medal in golf last year. She is pictured here with her golf partner, Martin Darcy. 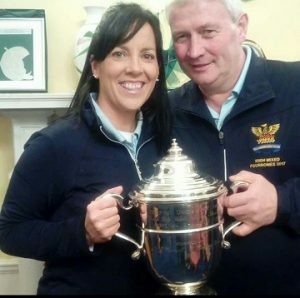 She played for her home club of Tullamore Golf Club in the All-Ireland Mixed foursomes 2017. Over 300 teams entered throughout Ireland and in September 2017 were crowned All-Ireland Champions. We are all very proud of her achievement here in the Metabolic Unit. Eilish, and her team, are starting off their year again hoping to defend their title and we wish them the very best of luck. This entry was posted in Healthcare Professionals News, Patient and Family News. Bookmark the permalink.